Episode 4 of Arakawa Under the Bridge was longer than the airing block it was scheduled for, so the epilogue and opening were cut out and streamed online instead. From the time we are young, are parents all/ teach us certain things. No matter what these deal with, there will usually be a very common theme: what society wants us to do. Yes, from a very young age, most of us will be told to continue the flow of society's ideas, and to never question them. But, what makes these ideas right? We see a romance that blossoms under this bridge, as Ko, a man whose parents who have installed far beyond just the rule that society is always correct, is pulled into entering a relationship with Nino, a person who claims to be a Venusian, on his belief that anything that anyone does is solely for gain and must be repaid. This belief that his father installed in him, however, quickly begins to fade as he subconsciously begins to reject the notion that society is always correct, and slowly embraces his new life under the bridge. Our story continues, with him continuing to meet more people under the bridge, and slowly coming to realize, yet again, that he can't really know what exactly is "right" and "wrong". Indeed, our story continues to progress in this vein, with Ko growing to accept the actions of the others all living under the bridge. All of the residents of this area also have to have a job (with the acceptation of a couple), and they all help each other in whatever sane ways they can, before their actions degrade into insanity, one of the real main sources for comedy in Arakawa Under the Bridge. Indeed, one of the most enjoyable elements of the show was all of our unique characters interacting in unique ways. All of these unique characters served to bring something special to the show; they all served a function for the community, while also bringing interesting elements the the show. They all have some kind of eccentricity that is very much ingrained in their character, or at least something that would render them unable to live in a regular society. These eccentricities were again, the source of nearly 100% of the comedy for the show, and the main thing that kept it interesting. However, what really disappoints is how often the characters are left completely untouched in terms of development. We don't get any back story on some of the characters, and on others, we only get tantalizing hints. This is, for some, the most irritating element in the entire show; we can almost never figure out the pasts of some of the most unique characters that we have ever seen. It is truly disappointing. If lack of characters development holds down the show the most, the next most irritating element is the art style. As it's shaft, we can really expect to see insanity in the rat as well, and so we do. It's really quite irritating to those who don't enjoy the Shaft animation style to b subjected to these incredibly well drawn scenes being forced down to mediocrity by terrible illustrations, which can really limit and interfere with the show for those who are not true connoisseurs of the Shaft art style. Sound also was only a slight break from the weaker elements of this show. It was really fair: there wasn't anything that really weighed it down , but there wasn't anything that really aided it in this department either. The voice actors were average, the sound effects were average; everything really failed to go beyond the average bound. Our opening and ending were also really, well, average, leaving the anime with average sound. While sound did not contribute to my enjoyment of the show, it certainly didn't hurt it. This show was highly enjoyable to anyone who liked the style of comedy, wasn't valued away by Shaft's art, and in general likes comedies and romances. I had a great deal of enjoyment from this show. So, now the question is, will you enjoy it? The best way to determine that is, especially if it sounds interesting, watch a couple of episodes. By that point, you will have gotten a good taste of the random art interferences and random characters that contribute to the general eccentricity of the show. You will have also seen the types of jokes told; if they seem like they'll get old, then you should leave. The jokes will often repeat, especially if the are part of a character's intrinsic personality. In other words, you will like this show if you like the first couple of episodes, aren't thrown off by the random art you see there, like the characters, and don't mind the general premise of the show in this regard. If it sounds interesting, give it a try. So long Arakawa Under the Bridge. It's been awesome!! Charming. This is what I constantly thought of when watching Arakawa Under The Bridge. Despite the insane plot and the ridiculous characters, this show was full of charm. Whether there was a hint of deeper meanings between it's comedic outtakes, or its abundance of heartwarming scenes, there never once was a dull moment during my time at under the Arakawa Bridge! 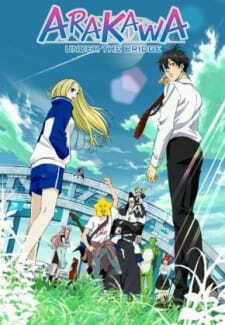 The story of Arakawa Under The Bridge is something that tends to turn many people off due to it's nonlinear approach. The story goes as follows; a guy who believes in never owing anybody anything gets his life saved after falling off a bridge by a strange girl. This creates a debt the size of well, his life! In order to repay this girl, he must show her what it means to love thus making him her lover. This sudden turn of events begins as he lives with the girl under the bridge where she and a bunch of other strange folk coincidentally happens to live! Sounds a lot to swallow? Don't worry, the story is way easier to grasp than what it seems.You see, to show someone what it means to love is such a universal topic that the entire series tends to be just about the guy and all the residents of Arakawa Bridge doing miscellaneous things each episodes. The series is jam packed with tons of comedy but also without realizing it, full of many other things. This leads me back to what I previously said; this show is FULL of charm. What Arakawa does best is to add heavy themes such as Acceptance, Regret, or being yourself while still keeping things to a lighthearted, comedic level. I loved when a funny situation would occur but at that exact same time, the main protagonist may learn something new about himself, or slowly, the girl would realize bit by bit what it truly means to love. Because of this, swallowing the insanity surrounding the show is much less a chore and much more a joy! Despite this: although I found the story one of the greatest aspects of the show, the opposite can be said for some. For starters, as previously said, this story is non linear to a tee. There is no single episode dedicated to, "What it means to love." Instead the story is really told through the character's every day encounters and actions with the members of the Arakawa River. While I found it interesting, this in turn can make people not want to watch the show if they were looking for a more direct plot. Furthermore, when the story did try to create a straightforward scenario near the last quarter of the series, I found that to be the weakest part of the series and I was anxiously waiting when that encounter can be settled and got back to more random tasks with the residents. Also, the outrageous surrounding of the show is of course not for everyone. This is indeed a WAAY over the top comedy, with no bars held back and if that's not your cup of tea, than this show won't change your mind otherwise. The Art of the show in general would be classed as standard fair for the anime at that time. However, since "Shaft" were the developers for this show, (Madoka Magica, Bakemonogatari) you can expect to get some eye popping, over the top art work. the opening theme is especially easy to notice; full of vivid colors and beautiful scenery. Overall, the outrageous art of the show only added to fit the whole tone the show was trying to portray. Quickly though, the live action segments with the Kappa at the end of each episode is probably some of the most hilarious scenes I have ever seen. PERIOD. The sound of Arakawa under the bridge is not anything spectacular. There were no background music that particulary stood out to me, and instead I found myself simply engrossed in the dialogue to even notice. The opening and endings on the other hand is definitely worth mentioning. The opening theme of the show, Venus To Jesus is a light, moderate pace tune which is easily a good listen and can be enjoyed without any context. It definitely fits the lightheartedness of the show. The ending, Sakasama Bridge is a personal favorite. this once again, is a light, moderate paced song, but the melancholic feeling it gives off, really helps to describe the feel of those more heartfelt scenes in the show. Plus it's by Suneohair, whose also done works in shows such as, Honey and Clover! Last, without spoiling anything, there's a song titled, "Losers Wail" and if the title alone doesn't convince you how funny it is, than prepare to wail yourself if you do get the chance to listen to it! Talking about the characters in Arakawa under the bridge is difficult. You see, each resident of the Arakawa River is strange in it's own way, but only adds to the charm. For instance, you have a a Church Sister (who's not really a sister) that came from the military and acts like the Terminator, but with more dialogue. Not satisfied? You also have a Rock Star with a Star for a head, as well as Kappa (A frog like person). At first, these different personalities might be unsettling, but really, these Character really help to bring this story to life. You see, one of the main themes that Arakawa Under The Bridge tries to tell is acceptance no matter who you are. Despite these crazy appearances, I found myself genuinely liking these characters because of just how well the chemistry these social misfits had with one another. Whether they had a comedic relationship or a serious one, I enjoyed each one of them. A flaw to these characters however is that they're really isn't that much character development. Aside from our main lovers, Ko and Nino; despite how much screen time the rest of the cast received, they remained static from start to beginning. You may get a bit of story from the individual characters, but they don't really grow as a person. If there was a particular person you might not have liked then unfortunately they will most likely stay that way until it's comedic conclusion. Arakawa Under the Bridge is INSANE! (In the good way of course!) Going into the show, I was a bit skeptical due to the amount of pure outragousness it posed. While it was still there, everything seemed bearable and in fact, better than what I expected it to be. I was also anxious to figure out what the crazy people of under the Arakawa Bridge would do next, and even though it's not genre breaking, it's originality and heart should be something that grabs viewers and drops them into unfamiliar, but wonderful territory! Welcome to Arakawa Under the Bridge! 'Arakawa Under the Bridge' is about Ichinomiya Kou, an elite (someone who holds a high ranking position or works in a blue-chip company. A "winner" in Japanese society) who's been taught to never get indebted to anyone, gets careless one day over Arakawa and gets saved by a girl. The girl's name is Nino, who turns out to be a denpa-kei (people with "overactive imagination" or nutcase, e.g. Nodame) who claims to be from Venus, and doesn't want anything in return. After a long debate, she tells Ichinomiya that there is one thing that he can do for her: "Let me fall in love." And so, Ichinomiya starts living under the bridge in Arakawa as Nino's boyfriend in order to repay his debt. Arakawa ("Rough River" in kanji) is a major river that runs through Tokyo. This is the river you have to cross to get to Saitama, and I can tell you it's very wide river that you do not want to fall into. I must admit that my expectation for this show after the first episode was really high because the setting of an elite suddenly living the poor man's lifestyle, and the general atmosphere was really similar to 'Koi ni Ochitara', a dorama series that's very dear to me. I found 'Arakawa's setting to be very intriguing with both Ichinomiya and Nino having interesting personality, and a funny encounter. 1. Focus on Ichinomiya and Nino's relationship as a romance anime. 2. Focus on Ichinomiya alone for discovery of small joys in life and gradual change of character belief, slice of life. 3. Focus on side characters for pure comedy. Instead, they went for no focus or central theme. Just a bunch of weirdos doing random things in the riverbank with very limited story or character development. Humor in this show was mostly physical, unintelligent slapstick, but wasn't really funny because the pacing is too slow for that. The side characters were a ridiculous bunch that had no distinct personalities that made them particularly lovable. They were all cardboard characters who received zero character developments. In the end, it seemed like the author was trying too hard to make unique characters just to make this show different. I have to say episodes 1, 4, 8, 12 where they focused on romance (#1) or slice of life (#2) were very strong and moving episodes, but otherwise all fillers. Story and character development was way too slow to be interesting. General animation by Shaft, there are lots of eye zoom-ins, but otherwise nothing out of the ordinary. The peaceful atmosphere of Arakawa riverside with vivid, light colors was visually pleasing. Animation quality was very inconsistent though. Episode 1 and some slow, dramatic scenes have movie-grade background detail and attractive characters, but the rest is super-simple (difference especially noticeable in sky grass texture). The two main characters seem somewhat realistic despite simplicity. The style is really similar to 'Nodame Cantabile', but the character designs for 'Arakawa' is actually better. The rest, while they are supposed to look out of place... never grew on me. It just seemed like a cosplay contest in a really unlikely place. Ridiculous number of big-name and experienced cast, even for the minor characters. Overall, voice acting is pretty good, but it doesn't really sound like any of them really put in too much effort. BGM is pretty average, but used in all the right places. Theme songs, on the other hand, were excellent. OP was cute and fun with retro graphics that worked really well to boost Nino's character. ED is a really good song that makes you reflect back on the episode. 'Arakawa Under the Bridge' had the potential to become a really touching and inspiring show if only they just focused on romance or slice of life. Instead, it became something I can't exactly describe, in a bad way. Something went really wrong with series composition that ruined a good original work. Pretty much only 4 episodes of material was in the first season, dragging on to the next. This is one of a rare non-prime-time anime series that I actually wished was shorter. I will be watching the next season in hope of a major turnaround. So, this show is a random humor enthusiast's heaven. It is sometimes funny, sometimes stupid, and often both. That could be the end of my review right there, but there's always more to talk about. For example, the art. The art is great. It is produced by shaft, directed by Akiyuki Shinbou, and is typical of Shinbou/shaft. If you are unfamiliar with shaft/Shinbou style artwork (most famous for Bakemonogatari), it is basically a collage of unconventional anime styles, that shifts around depending on the story. Lots of random fast cuts to land/city-scapes, sudden changes in the detail of animation, etc. It all is used in a way that seems to compliment the zany and random story. Also, in a great innovation, we now have windmill hair!!! The music is fun, even though the lyrics are silly. I'm a huge fan of the OP, not just for the song, but for the artwork that goes with it. The characters? Well, they are a bit cardboard, more or less used as gags to perpetuate the random humor. The story? Once again, just used to perpetuate the random humor. There is an underlying message in this show, that we don't have to do what society tells us, and sometimes it's better just to be ourselves, no matter how crazy that is :) Not a particularly deep message, but it goes well with the focus of the show. Enjoyment? Well, here's our problem. Everything in this show is sacrificed for the sake of random humor. Now personally, I wasn't too amused. I have trouble finding stuff amusing just because it is random. I mean, sure, when it's completely left-field, randomness is funny, but in this case it became a constant barrage of randomness and ceased to be terribly funny. It was still often funny despite this, but just as often it was stupid. My brain definitely turned off as I watched this. Many have recommended it to all Bakemonogatari fans, and I can't really agree with that. Bakemonogatari was a much smarter, character driven, and creative anime. Many fans will be dissapointed. That said, if you like Bakemonogatari, you might like this, so give it a chance. If you like random humor, then you will love this show. If you only like intelligent anime, then this show isn't for you. Is my Humor that far off... Or something else?